WASHINGTON -- More than two weeks after the end of the Democratic convention, President Barack Obama is maintaining and perhaps expanding the jump in his polling numbers against Republican nominee Mitt Romney, according to polls conducted both nationwide and in key battleground states. However, results from two daily tracking polls conducted by Gallup and Rasmussen Reports look contradictory: Both show a consistently closer contest than other polls. Both daily tracking polls also show Obama running slightly better against Romney now than they did earlier in the summer. The HuffPost Pollster tracking model, based on all available public polls, now finds Obama holding a lead of just over 4 percentage points nationally (48.7 to 44.5 percent). The model had found Obama with narrower leads of 1-2 points before the party conventions. The national numbers translate into statistically meaningful leads of similar magnitudes in most of the key battleground states. The HuffPost tracking model, which combines state and national polling, currently gives Obama leads of more than 6 points in Wisconsin and Ohio and slightly smaller leads in Nevada, New Hampshire and Virginia. 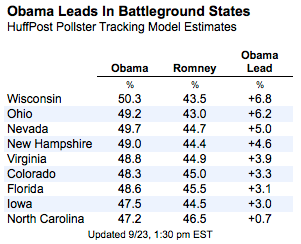 Obama is ahead by roughly 3 points in Florida, Iowa and Colorado. What puzzles many poll observers, however, is the contrast between these overall trends and the results of the two daily national tracking polls from Gallup and Rasmussen Reports. Both have shown a closer race nationwide over the past week, and both found an even bigger initial "bounce" for Obama in the week after the Democratic convention, which has since faded. First, the consistent differences between these two polls and other national surveys, commonly referred to as "house effects," are not new. Gallup and Rasmussen have been producing more favorable results for Romney all year. The sources of such house effects are seldom obvious, but in this case there are some clues. In Gallup's case, a Huffington Post analysis this past June found that Gallup weights its initial sample of adults so that minority representation in the sample is roughly 2 percentage points lower than in the U.S. Census estimate it uses as a target. Since Gallup then reports results for only a sub-sample of those adults -- registered voters (who constitute about 80 percent of adults) -- and since better than three out of four non-white voters support Obama, the underweighting of racial minorities likely explains the president's lower numbers in the Gallup poll. Gallup has announced no changes to its weighting procedures since the Huffington Post report, and it does not routinely disclose the demographic composition behind its Obama-Romney tracking survey results. As for the Rasmussen poll, it is one of the few national surveys to use an automated recorded voice to conduct interviews. Federal law bars pollsters from using automated dialers to contact cell phones, so pollsters that rely solely on automated cold calls will miss the nearly one-third of Americans now living in cell-phone-only households. Rasmussen claims to supplement its samples by conducting online interviews with cell-phone-only voters selected from a pool of Americans who have volunteered to participate in online surveys. However, Rasmussen has not published details of its "online survey tool" nor does it routinely disclose the number of interviews conducted online. Second, setting aside the consistent differences in the level of support measured by the various national polls, nearly all have found a small net trend in Obama's favor since the party conventions. Yes, both daily trackers did show an even bigger bump that has subsequently faded, but as of this writing, both are showing Obama doing slightly better now compared to their average results for the five weeks in July and early August before Romney selected Rep. Paul Ryan (R-Wis.) as his running mate. The shift has been slightly bigger for Rasmussen. The average of its results from Sept. 15 to 23 show an exact tie (46 to 46 percent), while its surveys gave Romney an average lead of roughly 2 points (46.4 to 44.5 percent) from July 2 to Aug. 8. Thus, Rasmussen shows a roughly 2-point shift in Obama's direction since the conventions. Similarly, Gallup gave Obama an edge of just 1.4 points (46.6 to 45.2 percent) in roughly 15,000 interviews conducted from July 3 to Aug. 8. Its most recent release, based on more than 3,000 interviews conducted from Sept. 17 to 23, gives Obama a two-point edge (48 to 46 percent). This difference is still small and within the margin of sampling error, despite the large number of interviews, but the direction of the change is consistent. The key idea is that both of the national telephone trackers are showing slight gains for Obama that are well within range of the shift in Obama's favor seen in the HuffPost Pollster tracking model, which gives the president a 2.7-point net gain compared to its July-to-early-August average. So again, if the trackers are different from other national polls, the contrast is more about the level of support they've been measuring for the two candidates than about the trend they have revealed. An important caution: Yes, President Obama has gained slightly during the convention period, a time that has produced the most important polling shifts in the past. Moreover, the 3-4 point lead he now holds -- taking into account all available polling -- is sufficient to sweep most of the battleground states and win reelection. However, a relatively modest decline in Obama's support could make the presidential race very close once again. CORRECTION: In an earlier version of this story, the text and a chart disagreed on the president's net gain between July-to-early-August and Sept. 24 under the HuffPost Pollster tracking model. The chart was correct: HuffPost Pollster had Obama up by 2.7 percentage points.